Back on the Market - NO FAULT OF SELLER. PRICE REDUCED! Meticulously maintained 4 bed 2 bath ranch home on 4.13 park like acres. When entering the home you will notice a warm and inviting open floor plan with neutral colors, vaulted ceilings, newer ceramic tile entry and a beautiful floor to ceiling stone, gas fireplace. The kitchen has 42" custom cherry cabinets, stainless steel and black appliances, center island with breakfast bar and pantry. Just off the dining area is a large covered deck that has access to the patio below with awe-inspiring views of a winding creek. The main floor master suite has a tray ceiling, large walk-in closet and bathroom with whirpool tub, separate shower and double sinks with vanity. Two more bedrooms and a laundry room finish out the main floor. The walk-out basement has lots of potential with one bedroom finished, a one chair salon and the remaining ready for your finishing touches. 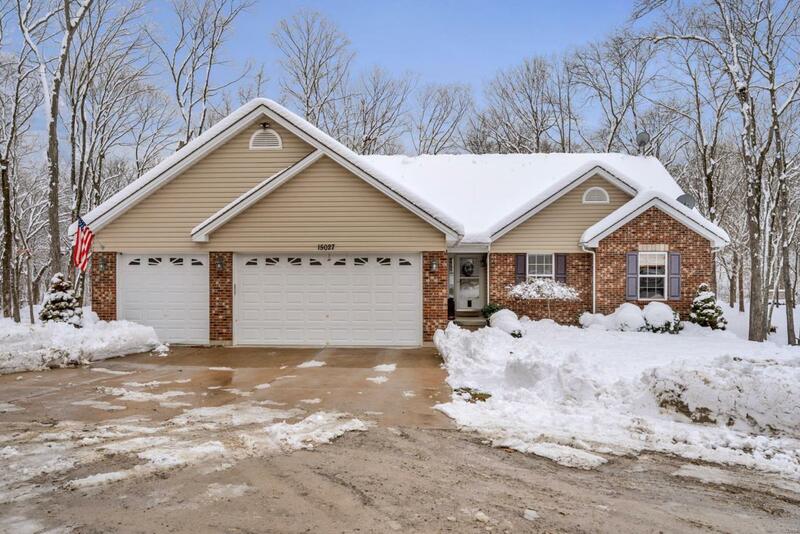 A 3 car garage and lots of privacy make this house a must see!! !